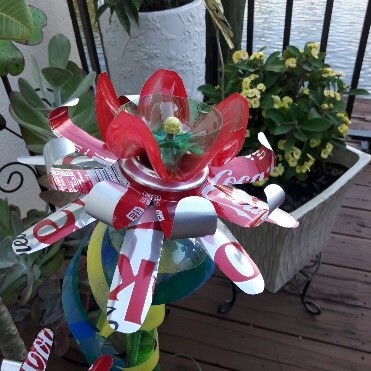 Recycle your plastic bottles and soda cans into fabulous exotic flowers. In this two day workshop you can learn to cut, drill, layer and paint your plastic bottles and soda cans into beautiful colorful flowers. Using a three ft. metal bar this workshop will show you how to cut, drill and attach the petal shapes to the bar. So… join the fun, bring your plastic bottles and lets make art out of plastic waste and help save the environment! This workshop will change your thinking about all those plastic bottles we throw away.